An 1845 edition of the periodic report1 of the Order of the Agustinos Calzados – “calzados” meaning shodden or wearing shoes, to distinguish this order from another Augustinian group operating in the Philippines during the Spanish colonial era, the “descalzados” or barefoot – provides brief descriptions of the towns in Batangas administered by priests of the order. These were the towns of Taal, Bauan (called “Bauang” in the document), Batangas, San Jose, Lipa, Ibaan and Tanauan. The brief descriptions include the number of “tributos” in each town – a “tribute” being a form of tax levied on an “alma” or soul, albeit the word was also used interchangeably to mean the person paying it; the topographic features of each town; and the incumbent “cura parroco” or parish priest. Taal was described as having been founded under the advocacy or care of Saint Martin2. Although the town was close to the sea, it was also on elevated and somewhat uneven land. From the people in the town were collected 7,265½ tributes. The town was close to a lake with “very deep waters” and drains into the sea by way of a river called Panapil3. The lake bred “excellent salmon4” and other “delicate fishes.” Although a freshwater lake, it was not unusual to see sharks, moors (a striped tropical fish) and other fishes that were typically found only in marine or saltwaters. The Taal Volcano eruption of 1754, the report continued, which blocked an earlier channel that connected the lake to the sea with “rains of sand,” ruined the original villages around the lake (Taal, Bauan, Tanauan, Sala and Lipa), the vestiges of which were preserved on the shores of the shores of the lake. The inhabitants of Taal were very much into agriculture, and cotton was among its chief produce. Because of this, the town’s women were engaged in weaving and the fabrics they created were considered among the best in the entire country. The town’s parish priest at the time was one Fr. Manuel Cruz Poblacion. According to the report, the town of Bauang was founded under the patronage of the Our Lady of the Immaculate Conception. The town was located near the sea, had uneven terrain and had 4,759 tributes. There were thermal waters in the town, particularly in Punta Azufre where the waters of the sea had been observed to seem like they were boiling even when the rest of the sea was generally calm. Bauang was blessed with resources: marbles of different colors, “exquisite” plaster crystals and a soft mineral called alabaster. 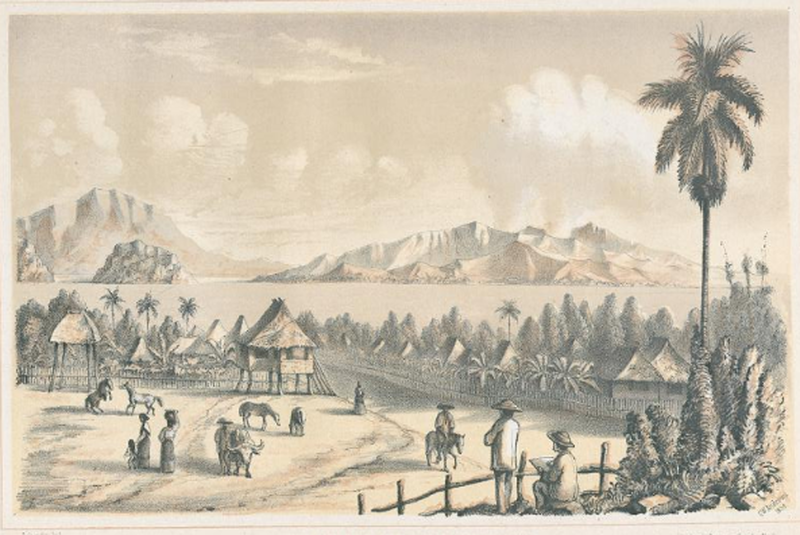 The town’s natives cultivated rice, cocoa, coffee, pepper and cotton. They also planted fernambuco, a dyewood native to Brazil, presumably for textiles woven by the town’s women from not only cotton but also abaca. The town bred plenty of livestock which were then sold in Manila. Its parish priest at the time was one Fr. Manuel de Arco. The church in Batangas early during the American colonial era. Image source; the Sandra Plummer Collection of the Fort Worth Digital Library. The then–town of Batangas was also said to have been founded under the auspices of the Our Lady of the Immaculate Conception. It was located on “uneven ground” by a bay of the same name and had 4,012 tributes. It was the capital of the entire province (as it is in the present day) and government was administered from a royal stone house. It could be reached from Bauang within an hour and two from the town of San Jose. In a place called Pinamoocan were “excellent quarries of limestone, marbles of various kinds and flints.” On mountainsides above the sea were petrified shells and reef stones that were used for making lime. The men of the town were involved in agriculture, fishing and trade with Manila and other provinces. The women, on the other hand, wove fabrics from cotton. The town’s parish priest was one Fr. Pedro Cuesta. The town, according to the report, was founded under the auspices of St. Joseph. The town was two hours away from Bauan, was located on hilly terrain and had a total of 2,342 tributes. At the source of the Malaquing Tubig River could be found a large quantity of volcanic rock called pumice and other minerals. The town had a mountain called Macolot (in 1845, the town of Cuenca, where Macolot is found, was still part of San Jose) which was very high and had a lot of granite. The town’s men were involved in agriculture and harvested a lot of wheat5. The women wove cotton and abaca fabrics. The parish priest was one Fr. Marcos Anton. The church in Lipa early during the American colonial period. Image source: the Luther Parker Collection at the NLP Digital Collections. The town of Lipa was founded under the care of St. Sebastian, was located on hilly terrain and had a total of 3,878 tributes. The travel time from Lipa to Batangas was four hours. Its men were into the cultivation of rice, coffee and cocoa, along with a lot of wheat. Women, on the other hand, wove cotton fabrics. Its parish priest was one Fr. Cristobal Anguiano. Ibaan was founded under the invocation of the apostle Santiago (Santiago is Spanish for St. James the Apostle6). The town is located on flat lands and could be reached from Batangas in two hours. It had 1,420 tributes. The men of the town were in agriculture and the women into weaving cotton fabrics. The town was administered by an “intern” priest named Fr. Jacinto Masancay. The town, according to the report, was founded under the care of St. John the Evangelist. It was located on hilly terrain and could be reached from the town of Batangas in six hours. It had a total of 2,324½ tributes. The men engaged in agriculture and harvested a lot of wheat, rice, coffee and cocoa. Women, like in other towns, wove cotton fabrics. The parish priest was one Fr. Martin Ruiz. 1 “Mapa General de las Almas que Administran los PP. Agustinos Calzados en estas Islas Filipinas,” published in Manila in 1845. 2 The patron of the town of Taal in Batangas is “St. Martin of Tours,” online at Taal.ph. 3 Since the Pansipit River is the only outlet of Taal Lake to Balayan Bay, we presume that the writer either committed a glaring error or there was an obscure other name for it in the 19th century. There are no references, however, over the Internet to a Panapil River. 4 There is a species of salmon called in Tagalog the “mamale” or the Threadfin Salmon (Mamale). Online at Fishing in the Philippines. 5 One is, naturally, tempted to suspect that the report likely meant rice instead, of wheat, but there were, indeed, instances of wheat planting in the Philippines during the Spanish era. “Wheat growing in the Philippines ,” an abstract, by Escano C. R., online at Food and Agricultural Organization of the United Nations.